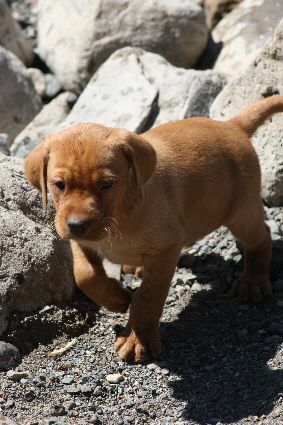 Currently taking deposits on Dixie X Harley red pointing lab Litter! We have red females available and ready to go to new homes the end of March! Hannah X Clancy litter of Hunting Labradoodles (can also go to non hunting homes, they have excellent noses and are very athletic) born March 1, 2019, will be ready around first of May. ​ Check out our Litters Page! ﻿ Morgan's Point Ranch has been a dream in the making for over the past twenty years. We are a small family with a handful of highly intelligent, versatile and beautiful fox red pointing labs which we have carefully selected for their natural pointing bloodlines, intense birdiness, candid personalities and easy-going social natures. We are situated on thirty acres in N.E. Washington's Chewelah Valley with the Colville River bordering us, nestled between the Huckleberry Mountain Range and the Selkirks. Here there is ample space to work with our dogs on retrieving downed ducks from the river, pointing pheasants, quail, and even the house cat. We welcome our future puppy owners to come visit and stay the night at the nearby Nordlig Motel in Chewelah, if needed, in order to have enough time to pick their puppy and drive or catch a connecting flight back home. If you are coming from Canada, it is very easy to bring your puppy home across the border, (just ask us). We aren't fancy but we love to make you feel welcome and to get you and your pup off to the perfect start. Check out our "Testimonials" page for more of what our past puppy owners have to say about us. By the way, we like to keep in touch and receive pictures from those of you who have chosen to make a Morgan's Point Labrador part of your family. Our puppy owners feel confident in their new adventure, especially knowing they are backed by the Morgan Puppy Health Guarantee! Our dogs are bred to suit your every need, be it family companion, waterfowl hunting, upland game hunting, or just about anything! Just a sampling of the genetic blend which make up a versatile Morgan's Point Pointing Lab! Owned by Tasha Deme of B.C. Check out our "Litters" page for more information on current and upcoming litters! 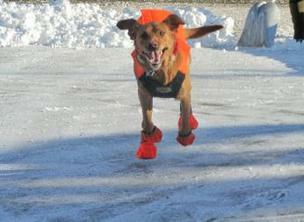 Talk About Versatility..... Our Dogs Can Drive, Too!